MEPs have spent the afternoon debating the appointment of Mr Selmayr, who was previously employed as Mr Juncker’s chief of staff, following claims that norms in the recruitment procedure were ignored to quickly install the Mr Selmayr. He was referring to Jacques Santer, who led the European Commission from 1995 to 1999. Mr Santer’s tenure was cut short when the Commission became the first to resign en masse after allegations of corruption emerged. 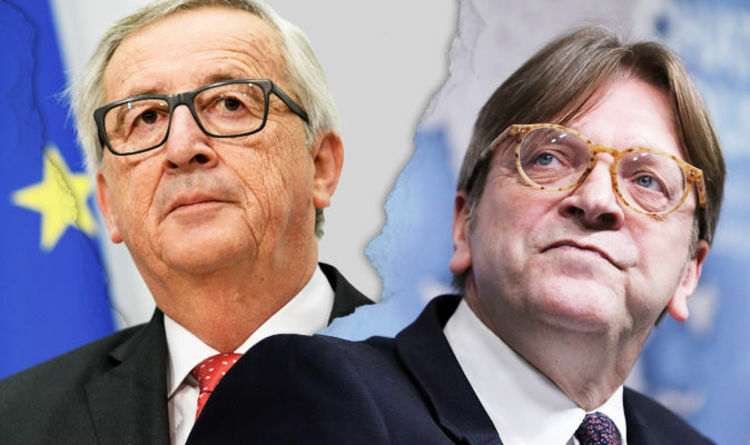 Mr Juncker and Mr Verhofstadt are old friends, and the 64-year-old’s public attack on his colleague suggests the European Commission chief may not be as secure in his position as once thought. Mr Verhofstadt also posted a clip of his European Parliament colleague, Sophie in ’t Veld, as she delivered a vicious attack on the “total lack of political judgement” of Juncker’s Commission. Ms in ’t Veld said: “Today’s debate is not about staff policy, it is about the total lack of political judgement of this commission. “That also applies to the absence of Mr Juncker, who likes to talk about his political commission, but politics also mean political accountability. The withering attack didn’t stop there, with Ms in ’t Veld accusing EU members of being “led by the nose by a civil servant” as she urged Mr Juncker to reconsider Mr Selmayr’s appointment, or face losing support from within the European Parliament. Mr Selmayr, 47, has been dubbed ‘the monster’ for his no-nonsense approach to politics and has been accused of employing ‘House of Cards’ style politics to push his agenda. One senior EU politician said the Commission was bounced into a fast decision. Selmayr’s predecessor, Alexander Italianer, had been given the role only moments earlier.